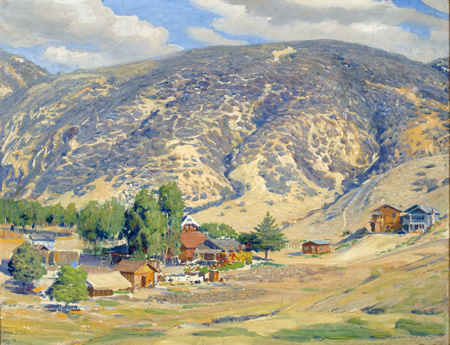 Joseph Kleitsch captures the landscape around his hometown in 1926. The painting, “Laguna Beach-1926,” by Joseph Kleitsch will be included in “Art in Nature: Legacy of the Land,” running through May 3, at the California Center for the Arts in Escondido. The painting was loaned from the Festival of Arts’ collection. Kleitsch, born in 1882, was a Hungarian-American portrait and plein air painter and noted member of the California school of Impressionism. 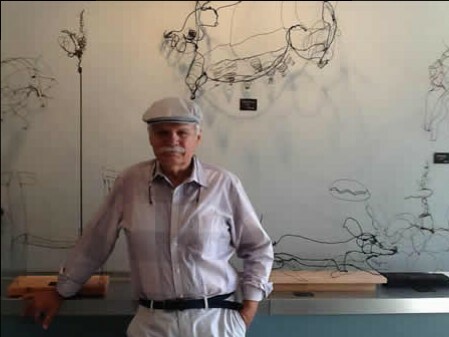 He was one of Laguna’s most noted early resident artists during the 1920s and ‘30s. Two years after his death in 1931, Kleitsch’s widow opened the Joseph Kleitsch Fine Arts Gallery in Laguna Beach. Tickets can be purchased online at: artcenter.org.or by calling 800-988-4253. 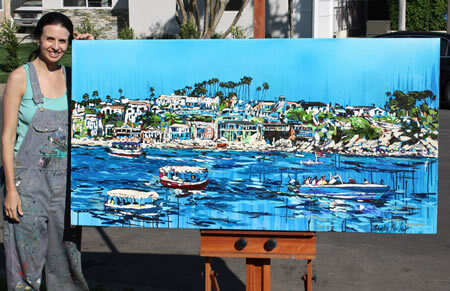 Local artist and longtime Laguna Beach resident, Michael L. Jacques admissions advisor at the Laguna College of Art and Design and author of “The Blue Rabbit,” will discuss color and its affect on daily lives from 1:30-2:30 p.m. on Sunday, March 29, at the Bowers Museum, 2002 N. Main St., Santa Ana. 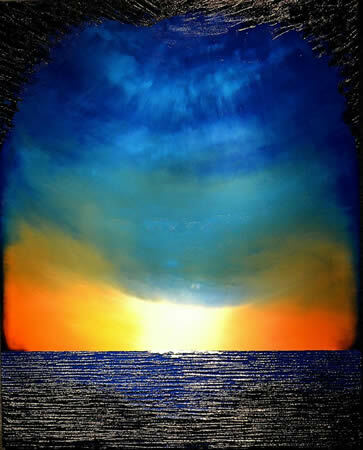 The Signature Gallery presents abstract artist Jenny Simon’s “Here Comes The Sun” cocktail reception on Thursday, April 2, from 6-9 p.m., during ArtWalk. Simon’s work is heavy with rich texture and bold colors. “Summer Sun,” an example of Jenny Simon’s work at 220 Forest Ave. Artist Brooke Harker’s new show, “Energies of the California Coast,” opens at Lu Martin Galleries, 372 N. Coast Highway, in conjunction with the First Thursdays Artwalk on April 2. Brooke Harker with work, Liberated Waters. 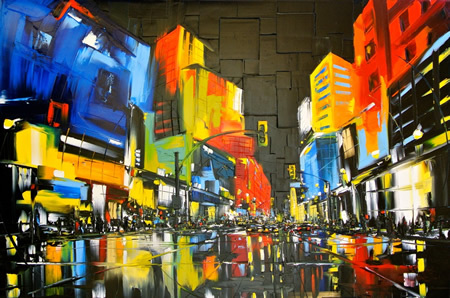 An artist’s reception takes place from 6-9 p.m.
French-Canadian artist Joëlle Blouin, 29, a featured artist of The Signature Gallery in Laguna Beach, won first place in the Artexpo New York Poster Challenge with her original oil painting, “Without Hesitation”, an abstract urban cubism depiction of Times Square. Blouin has received several large commissions from an Irvine law office. Artist Joëlle Blouin’s winning work. The Signature Gallery continues to display her work. Applications are open for the Collaborative Arts Development Experience, created by faculty from Chapman University, Cal State Fullerton and UC Irvine to enrich lifelong learners and emerging student artists in learning by doing. The experience allows students to attend six West End productions, live in residence at University College London, train at Shakespeare’s Globe and learn British dialects and acting through song. Recent graduates, currently enrolled arts students and non-student observers are eligible. To learn more and to apply, visit cadeoc.org. 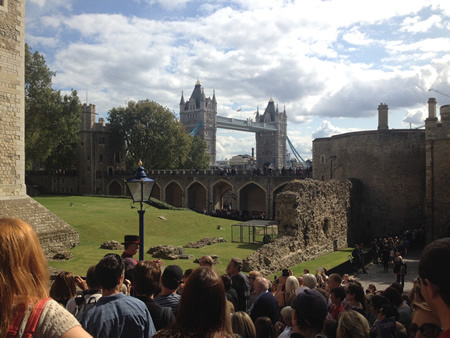 CADE participants visit London’s sights.